If you are a Augsburg Student or Alumni, like to play basketball and want the chance to win a t-shirt and $50, then grab a team and register for the "You have a Right to Ball" tournament! It will be held at Augsburg's gymnasium on December 16, 2017. Day 2 of The Drowsy Chaperone auditions. Large and small group dance auditions- dress for movement. Sign-up for the audition by the theatre in Foss. Augsburg College is one of the only higher education institutions in the country that offers a residential program for students in recovery from addiction to alcohol and other drugs. The StepUP® Program provides chemical-free housing, counseling, and a community of support for students. Since 1997, StepUP has helped students in recovery from addiction to alcohol and other drugs learn similar lessons about themselves. To date, more than 400 students from across the nation have participated and have maintained an 85% abstinence rate while in the program. They are successful in sobriety and in the classroom, earning a collective 3.2 GPA at Augsburg. To learn more about the StepUP Program at Ausburg College, go to the website or read "A Step in the Right Direction" from the Summer 2010 issue of the Augsburg NOW magazine. Below one student shares what StepUP means to him. For me, this time of the year is one of reflection and gratitude. October 8th is the anniversary of my sobriety and, this year, it will mark three years of recovery from addiction. Where there was once pain and darkness, there is now joy and light. From this joy, I give my deepest thanks to Augsburg's StepUP program. StepUP is a group of counselors and students who are committed to the recovery of its residents. With the support of students' respective 12-step programs, it has the power to change lives and the ability to support each of us through our daily challenges. Its importance lies in the fact that, while the average student may have his or her full attention to give to academics, the recovering student must balance a number of vital (that is, necessary to life) areas and activities. This is where StepUP steps in to help. A year ago, as an entering freshman, I was cautious of beginning college. I was unsure that I could succeed academically and also continue to grow in my recovery. But, when I found the StepUP program, I became confident. StepUP has since then been an integral part of my college experience and a blessing in my recovery. 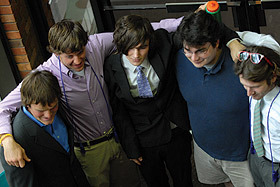 Of the program's many strengths, the fellowship is generally the most valued. We are a tight-knit community that will truly extend itself for the individual's growth. It is a community that, at almost three years of sobriety, I feel very fortunate to be a part of.